Happy Friday friends! It’s been a busy week here! If you follow me on IG you will have seen that I got a chemical peel. So for part of the week I kind of looked like Deadpool, but things have mostly peeled off and are on the mend. If you want to see more about it head to my IG account and click on my Skincare highlight. 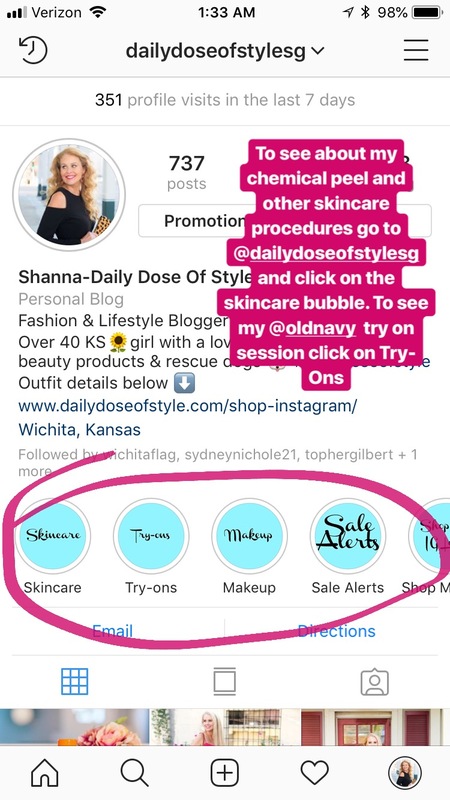 Speaking of IG highlights if you go to my Try On highlights I did a Old Navy try on session where I shared all of my favorite new fall goodies and they have some good ones right now! This weekend we are going to Woofstock, which is a fundraiser for our local Humane Society where everyone in town brings their pups, and they have all kinds of pet related booths set up along with pet costume contests, agility courses, owner and pet look alike contests, etc. We also are going to my twin nieces 2nd birthday party. Last weekend we took their 5 year old sister to the carnival, and we had so much fun! She was so excited, and seeing it all through her eyes was so cute! 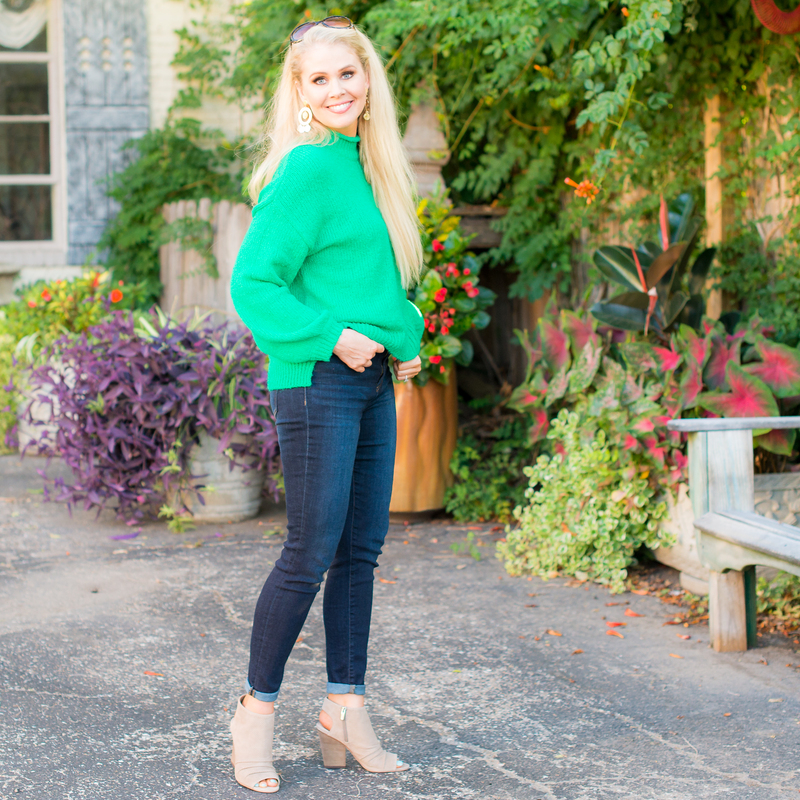 We have had a few days where we have been able to bring out our fall sweaters and this balloon sleeve sweater is one of my new favorites. It’s soft and gushy and covers the bum! It comes in a gorgeous red color too! I have it paired with my favorite high waisted jeans! My favorite sundress from summer is on sale for only $18 when you use code BIGSALE! I sized up in it as I didn’t want it to be too tight, and I like to use it as a swim cover up too. It’s perfect on its own, and I bring it into fall by throwing my favorite jean jacket on over it. This lightweight cardigan is so perfect for this fall transition weather! It comes in a bunch of great colors and is less than $13! The striped tee I have underneath is one of my favorites as it holds up well and gives you enough room to tie it in the front if you want. It comes in 16 colors and I have several! This little round crossbody bag goes with everything and is less than $40! Here is another one of my favorite sundresses from summer. It’s perfect for some of us ladies over 40 who are smaller on top and carry our weight on the bottom. It’s another one where you can top it with a jean jacket or cardigan and bring it into fall! If you haven’t heard Express is having a 40% off sale! They have so many cute things! 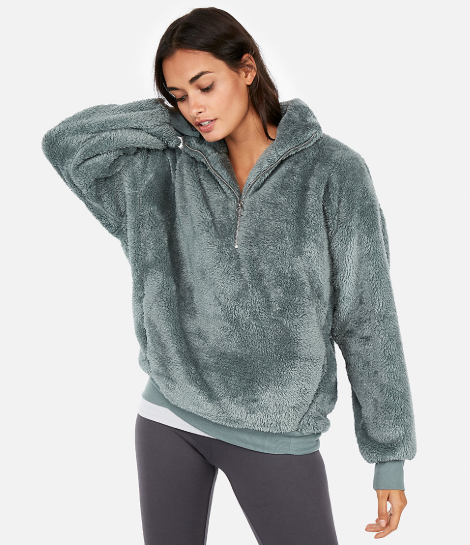 When I was there the other day I tried on this Fleece Quarter Zip Sweatshirt and it is amazing! If you buy nothing else you need to get this as it will sell out! It is so fluffy and soft it is ridiculous! It comes in 4 colors and is 40% off! Here are the rest of my favorites from Express! EXPRESS– 40% off of Everything! !